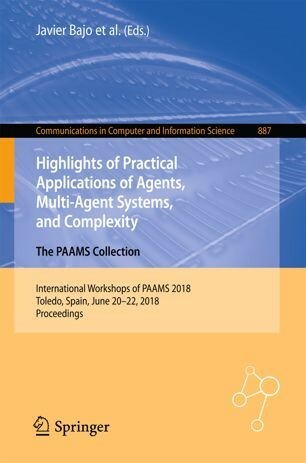 The 16th International Conference on Practical Applications of Agents and Multi-Agent Systems (PAAMS 2018) took place on June 20-22 in Toledo, Spain. It was organized by the University of Castilla-La Mancha (Toledo), University of Salamanca, and Technical University of Madrid. This conference was sponsored by the IEEE Systems Man and Cybernetics Society Spain Section Chapter and supported by the IBM. The main objective of PAAMS 2018 was to present, discuss and disseminate the latest developments and the most important outcomes related to real-world applications. It provided a unique opportunity for multi-disciplinary experts, academics, and practitioners to exchange their experience in the development and deployment of agents and multi-agent systems. PAAMS 2018 brought together researchers and developers from industry and the academic world to report on the latest scientific and technical advances in application of multi-agent systems, to discuss and debate the major issues, and to showcase the latest systems using agent-based technology. It promoted a forum for discussion on how agent-based techniques, methods, and tools help system designers to accomplish the mapping between available agent technology and application needs. · User-centered applications and assisting agents. The Conference was attended by participants from many countries – the USA, the UK, Scotland, Russia, Germany, Poland, Italy, France, the Netherlands, Austria, Switzerland, Estonia, Spain, Portugal, Brazil, Colombia, Ecuador, India, Oman, Senegal, Japan. Conference reports represented various aspects of application and validation of agent-based models, methods, and technologies in a number of key areas, including: energy and security, engineering and tools, evaluation and ethics, negotiation and organizations, personalization and learning, simulation applications, simulation platforms, social networks and humans. Professor Petr Skobelev was the plenary speaker at the Conference. Professor Petr Skobelev made an Invited Talk “Towards Autonomous AI Systems for Resource Management: Applications in Industry and Lessons Learned”. This lecture was focused on complexity of modern resource management related to a large number of decision-makers, high variety of individual criteria, preferences and constraints, interdependency of all operations, etc. The paper provided an overview of existing methods and tools of Enterprise Resource Planning and the key requirements for resource management. Besides, the concept of autonomous Artificial Intelligence (AI) systems for adaptive resource management based on multi-agent technology was discussed. Petr Skobelev presented a multi-agent model of virtual market and a method for solving conflicts and finding consensus for adaptive resource management. Further, the lecture presented the functionality and architecture of autonomous AI systems for adaptive resource management and the approach for measuring adaptive intelligence and autonomy level in these systems. Moreover, it also demonstrated the results of autonomous AI solutions for managing trucks and factories, mobile teams, supply chains, aerospace and railways, as well as a considerable increase of enterprise resource efficiency. Finally, Professor Skobelev outlined the lessons learned from industry applications and future developments of AI for solving extremely complex problems of adaptive resource management. Professor Petr Skobelev was also the Сhair of the Session 6: Energy and Security. Our team also presented a demo paper within the Session 3: Negotiation and Organisations. The paper was titled “Swarm of Satellites: Multi-agent Mission Scheduler for Constellation of Earth Remote Sensing Satellites” by authors Petr Skobelev, Elena Simonova, Alexey Zhilyaev, and Vitaly Travin. The lecture presented the multi-agent system for scheduling of a constellation of Earth remote sensing satellites. The functionality and architecture of the system were presented and the key scenarios of event processing were given in order to demonstrate the advantages of multi-agent technology. · Workshop on Multi-Agent Systems and Simulation. Our team also participated in the Workshop on Agent-Based Applications for Air Transport. We presented the paper “Designing Multi-Agent Swarm of UAV for Precise Agriculture” by authors Petr Skobelev, Denis Budaev, Nikolay Gusev, and Georgy Voschuk. The lecture proposed multi-agent technology and a prototype system with together-acting UAVs for joint survey missions. The prototype can make it possible to connect UAVs in a united swarm, propose coordinated flight plans and adaptively re-configure plans due to disruptive events. A series of simulation experiments and several flight tests were described to evaluate the effectiveness of the distributed scheduling mechanism. The aim of the current and future developments was formulated as the creation of complex solutions for coordinated management of UAVs for precise agriculture. 1. Michael J. North. Hammer or Tongs: How Best to Build Agent-Based Models? 2. Jean-Baptiste Blanc-Rouchoss, Anne Blavette, Guy Camilleri, and Marie-Pierre Gleizes. Electric Vehicles Fleet for Frequency Regulation Using a Multi-Agent System. 3. Davide Calvaresi, Alevtina Dubovitskaya, Jean Paul Calbimonte, Kuldar Taveter, and Michael Schumacher. Multi-Agent Systems and Blockchain: Results from a Systematic Literature Review. 4. Benjamin Hoffmann, Kevin Chalmers, Neil Urquhart, Thomas Farrenkopf, and Michael Guckert. Towards Reducing Complexity of Multi-agent Simulations by Applying Model-Driven Techniques. 5. Mohammad Al-Zinati and Rym Zalila-Wenkstern. A Resilient Agent-Based Re-organizing Traffic Network for Urban Evacuations. 6. Tanguy Esteoule, Alexandre Perles, Carole Bernon, Marie-Pierre Gleizes, and Morgane Barthod. A Cooperative Multi-Agent System for Wind Power Forecasting. 7. Svitlana Galeshchuk and Sumitra Mukherjee. Cooperative Agents for Discovering Pareto-Optimal Classifiers Under Dynamic Costs. 8. Jaroslaw Kozlak, Malgorzata Zabinska, and Yves Demazeau. Environment for Identiﬁcation of Signiﬁcant Subjects on Information Portals. 9. Marcelo S. Menego, Jomi F. Hubner, and Leandro B. Becker. Evaluation of Multi-agent Coordination on Embedded Systems.Aaron Rodrıguez and Luis Castillo. A First Step Towards a General-Purpose Distributed Cyberdefense System. 10. Giuseppe Albanese, Davide Calvaresi, Paolo Sernani, Fabien Dubosson, Aldo Franco Dragoni, and Michael Schumacher. MAXIM-GPRT: A Simulator of Local Schedulers, Negotiations, and Communication for Multi-Agent Systems in General-Purpose and Real-Time Scenarios. 11. Collin Gordon and Munehiro Fukuda. Analysis of Agent-Based Parallelism for Use in Clustering and Classiﬁcation Applications. 12. J. Jord´an, J. Palanca, E. del Val, V. Julian, and V. Botti. MASEV: A MAS for the Analysis of Electric Vehicle Charging Stations Location. 13. Marcelo S. Menegol, Jomi F. H¨ubner, and Leandro B. Becker. Coordinated UAV Search and Rescue Application with JaCaMo. 14. Brıgida Teixeira, Francisco Silva, Tiago Pinto, Gabriel Santos, Isabel Praca, and Zita Vale. Demonstration of Tools Control Center for Multi-agent Energy Systems Simulation. 15. B. Torabi, M. Al-Zinati, and R. Z. Wenkstern. MATISSE 3.0: A Large-Scale Multi-agent Simulation System for Intelligent Transportation Systems.